This how-to will help you install and configure NGINX so you can run high traffic websites while maintaining the high level of performance your customers expect. We are also going to install additional software in order to get the most out of NGINX, so this guide will also include installation and configuration of MySQL, PHP-APC, and PHP-FPM. Why NGINX? There’s a long back and forth debate over whether you should use Apache or NGINX, and while the overall performance of the two web server platforms is roughly the same, NGINX’s event-based processing model shines by being simple, lightweight and simply better at handling large amounts of concurrent hits for static content without overly taxing your server hardware. – You need a CentOS 6.7 server configured with a static IP address. If you do not have a server already, you can visit our Cloud Hosting page and spin a new server up in under 30 seconds. To get started, login to your CentOS server via SSH. Atlantic.Net Cloud servers are setup as minimal installations in order to avoid having unnecessary packages from being installed and never used. Because of this, we’re going to start out by installing a couple of packages not there by default. Once you are logged in, make sure that your server is fully up-to-date. With the server up-to-date, we can continue the process and install NGINX. Since NGINX is not included in the default CentOS repositories, we’re going to use the Extra Packages for Enterprise Linux (EPEL) repo. We are also going to use packages from the REMI repositories further in the process, so let’s download and install that as well. Next, download the most recent (at the time of publication) version of both repositories. You can check for them here and here. Before we move on, we’re also going to make a new user and group that will be used by NGINX and PHP-FPM. If you leave users and groups using default settings, everything should still work for you, but to help provide that little bit of extra security we’ll be making the change. While we are working on server preparation, let’s go ahead and setup a new directory for our web server. Normally people use /var/www/html for their sites, but I’ve always been more comfortable having site files in /home/domainname.tld/html, so that’s what we’ll use. For the walkthrough, we will be using example.tld as our domain — make sure to update the bold entries so they match the domain that you are configuring. Now that we have finished preparing the server, we can move on to the installation of our software packages. 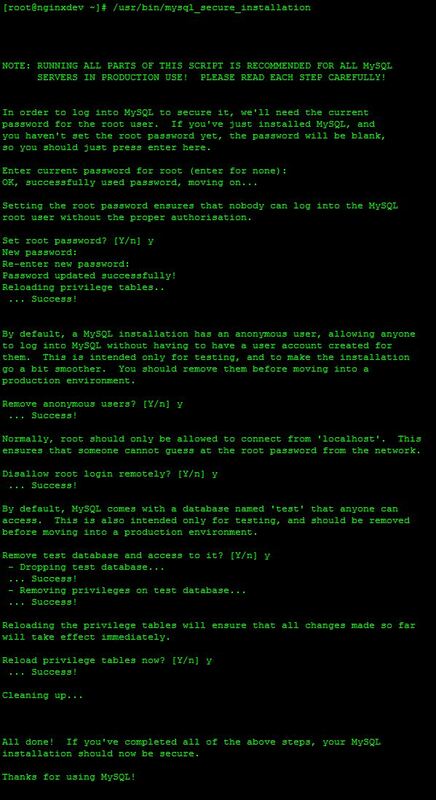 The MySQL Secure Installation process will walk you through initial security changes that should be put into place for your new MySQL instance. Note: Chose a secure password and limit root access to localhost only. We’re going to restart all services at the end, so let’s move on. Next we need to setup our domain configuration file. This is done by creating a new file named /etc/nginx/conf.d/example.conf. Again, make sure to update the bold entries to match the domain you are adding. Because we changed the user that NGINX runs as, we need to make a change ownership permissions for the NGINX temp files. Again, we’re going to restart all services at the end. Moving on, instead of installing a full version of PHP on the server, we’re going to PHP-FPM – an alternative PHP FastCGI implementation. 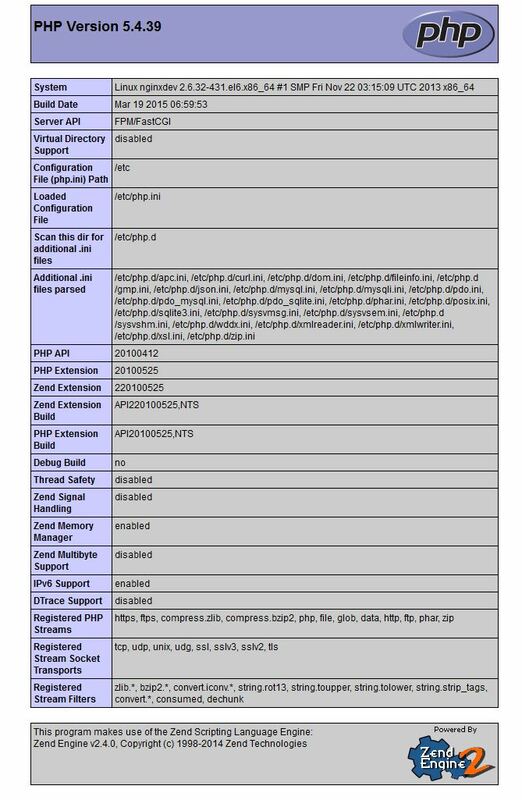 Note: After the install, we need to update the “cgi.fix_pathinfo” setting to disable a potential vulnerability that could allow a 3rd party to execute their own PHP code on your new server. The final piece of the puzzle is going to be installing a PHP accelerator to further improve static file load times. If the configuration comes back with “nginx: configuration file /etc/nginx/nginx.conf test is successful”, we can start (or restart) all services and make sure that all services are set to start on system startup. As our final step, we’re going to verify that the configuration is working by making a info.php test page, and moving a copy of the default index.html to our sites home directory. As before, make sure to update the bold entries with the domain that you are setting up. Visiting http://example.tld should show the default index.html file. Visiting http://example.tld/info.php should show information about PHP. With that, you now have a server running all the necessary components to run your website! Our configurations in this walk-through are setup specifically for WordPress. Please see our WordPress setup guide. Please check back here for more updates, and to consider a market-leading cloud server from Atlantic.Net.